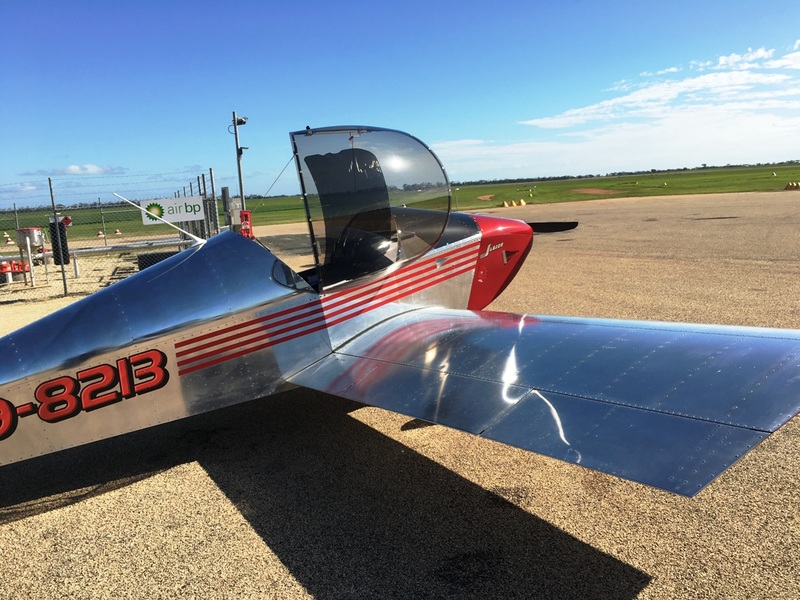 Well not quite the way it sounds, but an opportunity to fly up to Griffith for a family visit presented itself in the form of a big high transiting the Great Australian Bight over the 29/7-1/8/16. My wife Lynne had been up there since the week before to help out with grand daughter number one while Sheree and Nathan waited for imminent arrival of grand baby number two. On Wednesday 27th July Connor Michael arrived in the world. So consulting BOM, willyweather and the 4 day forecast maps, the indications were a cold front would move into South Australia on the Sunday afternoon/night so I would have to keep an eye on it. On the Thursday before, I had tried to contact Griffith Aeroclub for info on tiedown areas etc, but the phone line kept going straight to fax. I did find a mobile number on the RaAus site but no response to a message sent to that one either. Oh well just wing it then! 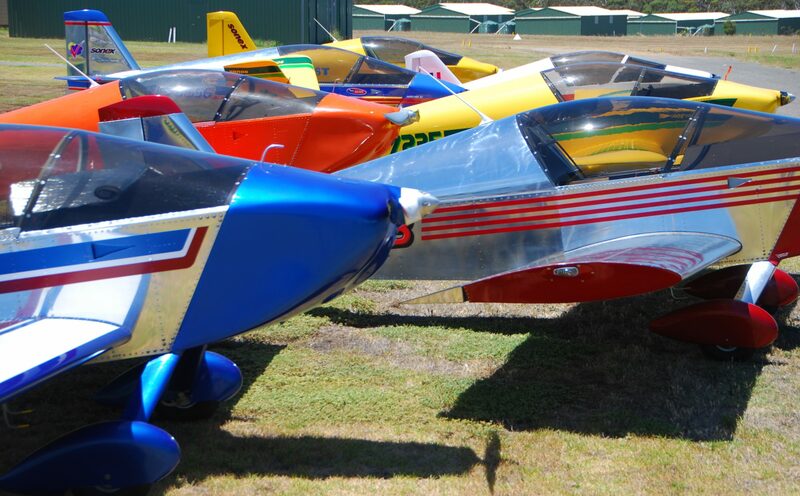 Just before I left home Friday morning, I received a call from Nyla at the Aeroclub who gave me some very welcome news, rather than tiedown in the open hangarage was available friday and Saturday night for a modest outlay of $22, whoo hoo! Pulling up to the hangar at Callington I had expected to see a bit of fog about but it was relatively clear out to the east, with stratus at about 2000′ over the strip. no solar heating of the cockpit for most of the trip, which was a good move! Flight plan was relatively simple, track to Swan Hill and refuel, then head north east for Hay, and turn a little more easterly to set course for Griffith. A check of Rex arrivals and departures schedules for Griffith, suggested there shouldnt be any heavy traffic about in the mid afternoon. Takeoff was exactly 2359Z and before long we settled into a nice cruise at 3500′ past Tailem Bend with a ground speed of 115kts. I love tailwinds. Approaching Lameroo I could see the top layer of stratus coming down to a lower patch of broken cumulus sitting at around 1500′, obscuring the horizon towards Pinnaroo.. the classic grey trap.. mmmm. I turned 180 deg to check the weather behind and it was still clear, so I decided to descend below 1500′. If I couldn’t see a clear horizon along track, then I would do a 180 and head back towards Tailem Bend. Alternatively, veer north east to get around the broken cloud that seemed to be moving across from the south. 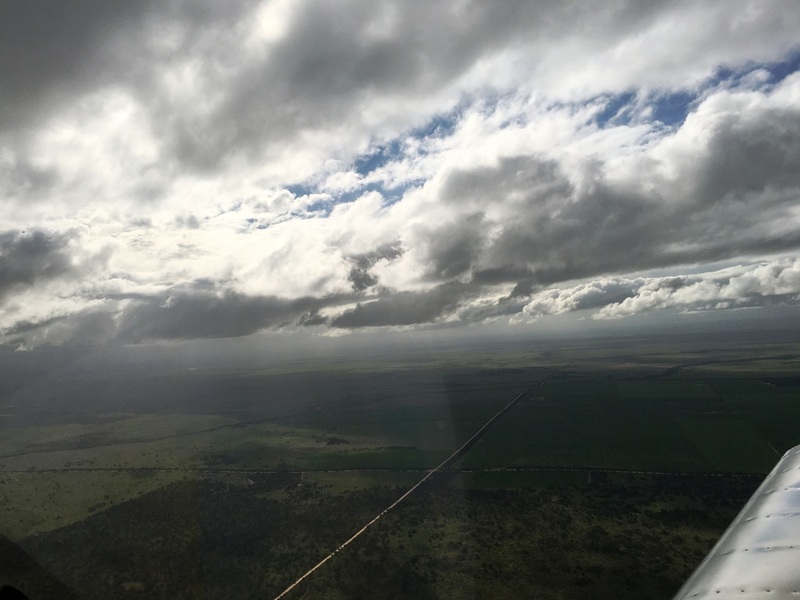 Passing Pinnaroo township at 1200′ and at a safe distance from puffy clouds and spots of drizzle, I could clearly see the horizon and cloud lifting in the distance with patches of bright sunshine on the ground. Out to the left of track the puffies had disappeared so there was the option to go that way or continue for another couple of minutes on track, then climb back up to 3500′. Decided to keep on track and not long after passing Pinnaroo airstrip I was clear to climb back up to cruising height. It was like a big finger of cloud from the south had parked itself over Pinnaroo just to make it a challenge to get around. Interestingly on the way back Sunday it was almost the same situation. After 2.2 hours the Swan Hill airstrip came into view in bright sunshine and I set myself up for a landing on 26, landing into wind virtually straight down the runway from the west. Notams for Swan Hill hand declared all the grass runways as soft and unservicable from recent rains so it was just as well. Refueled to the brim with 40 litres, the sound of gurgling fuel and a cold brisk wind did not help quieting the bladder alarm that had been ringing since Patchwollock. I parked the aircraft just on the aprons grass verge after testing for softness with number 10 boots. Self defuelling accomplished, I made my way to the clubhouse for a coffee and sandwich for lunch. Glancing over my shoulder, I could not help but notice a noisy Aerocommander twin driver blasting his way onto the runway 26. Minutes later whilst making my coffee in the clubhouse, I was alarmed by the sound of two large piston engines, revving full power, seemingly very close to where my machine was parked. The flight to Griffith was expected to be about 75 mins with a GS of 116kts across terrain I hadnt flown over before. I was a little nervous as the ground looked far too green from height with lots of irrigation channels, full dams and few roads crossing the land. At least it was sunny but OAT was a balmy 5C at 3500′. As I approached Hay I could see semi’s making there way across the Hay plain, a bit of nostalgia, as I remembered my days as a very young RAAF apprentice driving my trusty EK holden from Wagga to Adelaide some 40 years ago! 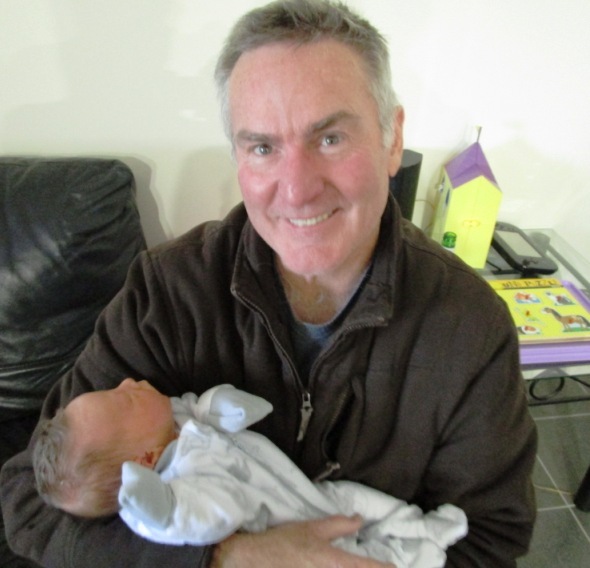 Meeting my Grandson was the highlight.. and catching up with Sheree and Nathan. Homeward bound out past Hay tracking for Swan Hill, frontal cloud to the right. Turning over the Hay airport I set course for the final leg. A couple of text messages to Nathan to let him know I was about 30 mins out, and we droned on towards Griffith. Tuning in the Griffith CTAF frequency there appeared to be no one about, apart from a helicopter doing a right base approach onto 06. Grabbing the ERSA printout I checked the fine details, one runway 24/06 and a dirt runway 18/36, also Notam’ed U/S because of recent rain. 10 miles out, under a high overcast, I thought I could see the main rainway aligned right on the nose, however as I got closer I could see it was actually a big wide irrigation channel! Oh the airport is a mile further on ha ha. Griffith elevation is 439′ so I flew over at 2350′ to hopefully be above everything. A check of the windsock indicated a slight crosswind from the left on the 24 runway, perfect. Calls made I let down to circuit height for a crosswind join on 24 and full stop right on 2:30pm local, my planned ETA. Nyla from the Aeroclub popped out the door and started walking towards the hangars as I taxiied in, so I guessed that where I would be parking. 20 mins later the Sonex was packed away in dry comfort and with rucksack in hand I met Nathan in the carpark for the trip out to the new chicken farm near Goolgowi. Sheree had only just gotten out of hospital the friday morning so she was a bit tired and wasted no time in handing me Connor Michael for a cuddle. It was great to see everyone and celebrate the arrival of Connor, however I wasn’t so flash saturday 🙁 Oh well doesnt happen very often. Sunday morning 9.00am arrived all too soon with the sound of rain on the tin roof, oh oh. I caught a lift out to the airport with Nathans Dad for the trip home. The sky was overcast with the odd shower and drizzle about but it looked fine towards the west. A preflight, flight plan filled in and top up of the tank with 27 litres of Mobils finest, it was time to startup and taxi out in very light drizzle for the trip back. A little bit of confusion (a.) as to where one of those helicopters were on their right base again into 06, and (b.) dont taxi into the GA bay near the terminal as there isnt a way out onto the taxiway A/24 hold point. The spectators in the clubhouse were somewhat amused. Even though the main runway is 1740 metres I taxied down to the threshold of 24 and powered up for the takeoff. After a relatively short run we were airborne and climbing for an overhead departure to Hay. Maintaining heading 242° at 4500′ revealed a ground speed of 90 kts, the inevitable headwind back to Adelaide! Payback for the quick trip up I suppose. As I approached Hay the overcast disappeared and we were in sunshine once again. 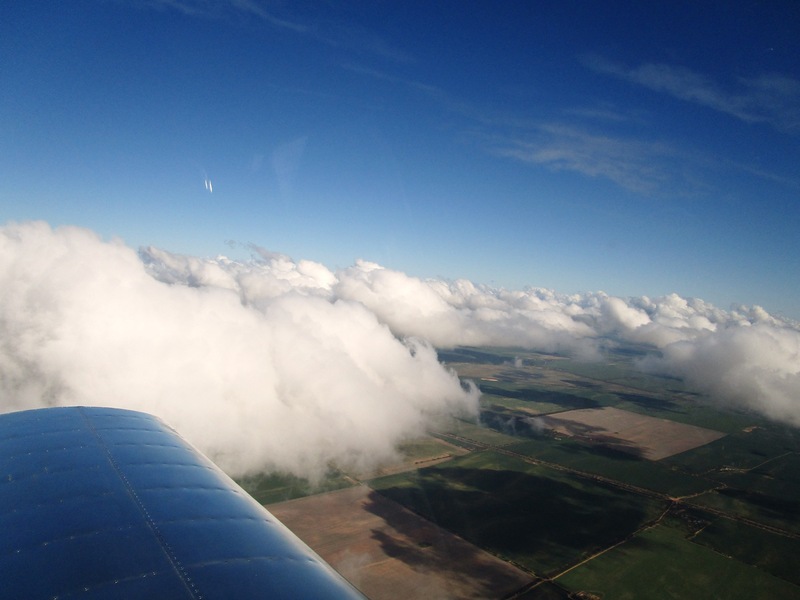 Flight plan forecast winds aloft had ground speeds as low as 85knots from Hay to Swan Hill. Luckily I still had 90 kts and it gradually increased to 95kts GS as I got closer to Swan Hill. I could see a large band of high cloud to the north west so this was obviously the fringe of the approaching front. Landing and refueling were a non event at Swan Hill, flight time was about 90 mins compared to 75mins on the Friday. A quick bite to eat and a drink and I was away again tracking west. Scattered clouds started to appear at about 2500′ approaching Patchwollock, but their tops were still below 3000′ so at 4500′ not a problem. Past Patchwollock and they were started to top 4000-4500′ and become more numerous. At least the high stuff was till well to the north and north west. Approaching Murrayville and the VIC/SA border the clouds had increased dramatically and I could no longer see the ground ahead so it was time to descend under cloud base at 2300′. 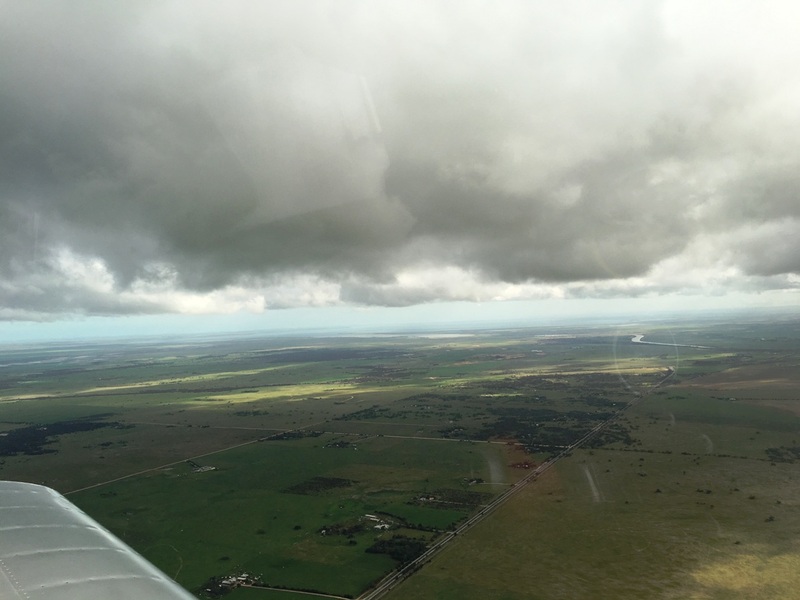 Low and behold it was lower again at 1500′ over Pinaroo and drizzling a little, veering to track north the cloud again lifted and I was able maintain 2000′ for the rest of the trip across to Tailem Bend. Passing a little strip near the town of Sherlock I did a quick orbit to check out what appeared to be the owners Neuiport biplane on the strip. Closer inspection revealed a white 4 wheel drive parked across the runway 2/3 rds along. It was his U/S runway marker! Rain had made the surface too soft so he had to do something to prevent people landing over the weekend! It worked ha ha. 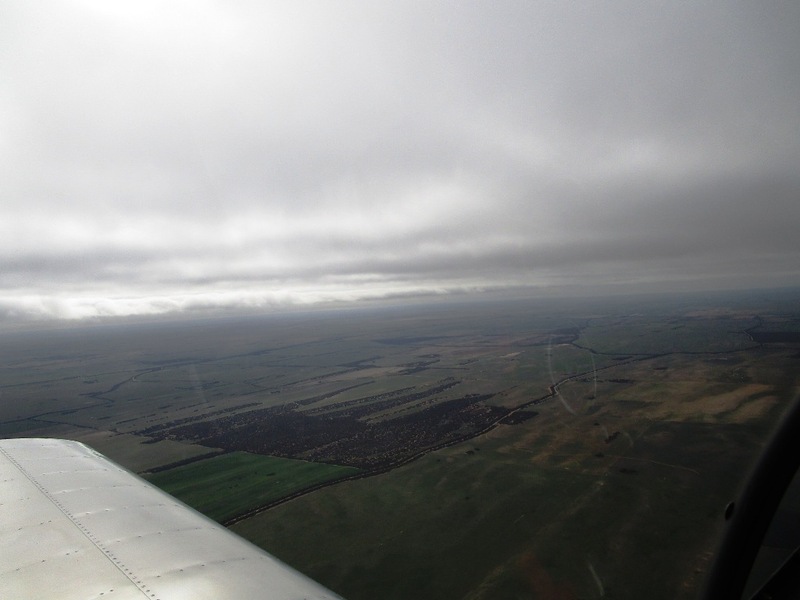 The clouds were starting to show signs of impending moisture as we flew past Tailem Bend but the GPS ground speed of 95kts and smoke from a couple of fires burning on the plains seemed to indicate the windy end of the front hadn’t really arrived yet. Passing through the southern edge of the Murray Bridge CTAF I called inbound to Callington and with a couple of bumps in the lee of the hills we were overhead the eastern ridge bounding the airfield. After 2 hours and 30 mins, I was rewarded with a perfect 3 pointer as the gear touched down softly on the green grass of Callington airstrip. 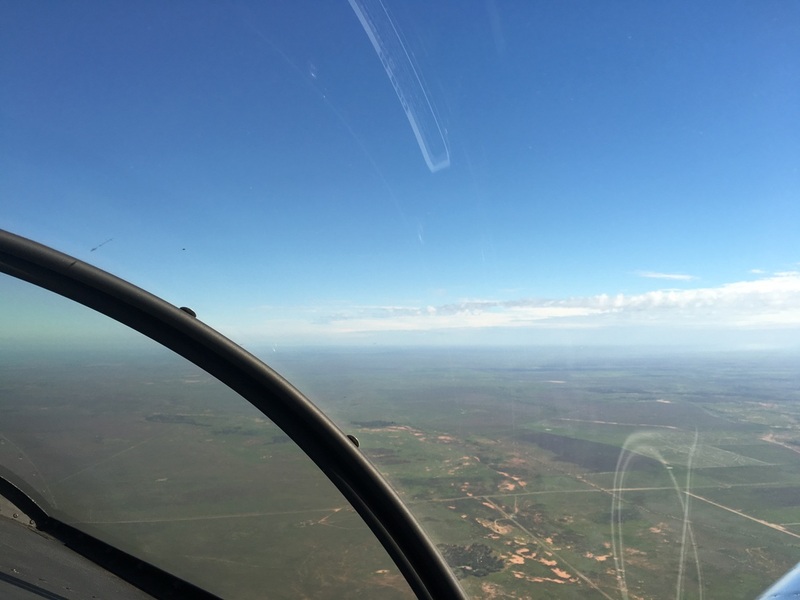 A great trip all round and displays the versatility of the Sonex aircraft, sure beats 18 hours plus of driving hands down, Hay Plains nostalgia included! Puffies building near Patchwollock Vic. Starting to buildup near Murrayville but wind less than 10kts on the nose. 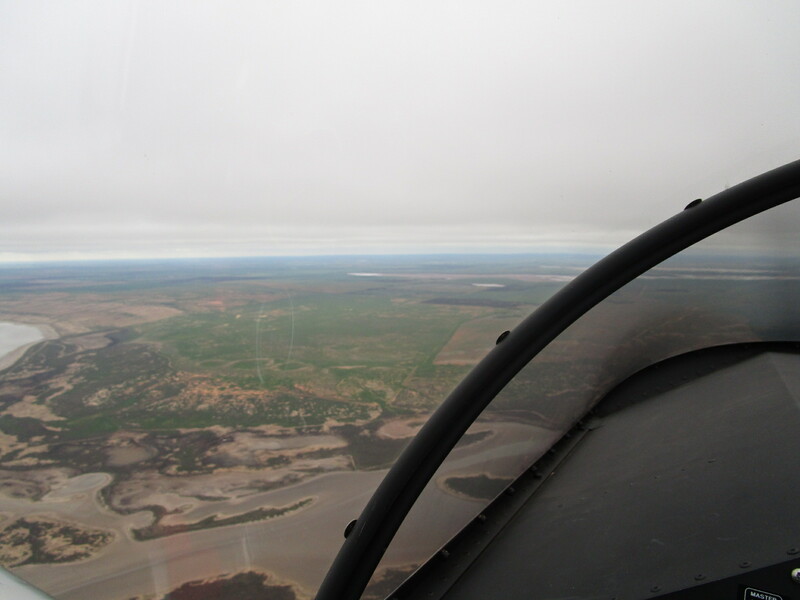 Tracking towards Tailem Bend, Murray River and Lake Alexandrina in the distance. Clouds starting to look like rain!